Silent Waters Villa won the Caribbean World Travel Awards Best Villa of the Year for 9 straight years! Silent Waters is a spectacular private home located on 16.5 acres on one of the highest mountaintops overlooking Montego Bay. Glamor, romance and flair define this remarkable vacation site, which consists of beautiful gardens, ponds and numerous private meditation areas throughout. This award-winning Jamaican holiday home is distinguished by world-class architecture, design and decor, breathtaking location, and exquisite accommodations and service. Silent Waters Villa is a superb location for a family reunion, corporate retreat, destination wedding (seating 54 guests) or just a small group of friends seeking a most unusual holiday experience. Nestled in the hills of Jamaica, overlooking pristine forests and the spectacular turquoise waters of Montego Bay sits a truly remarkable private Jamaica resort property .... an enchanting heaven. Silent Waters Villa is 4.6 miles west of Montego Bay on the North Coast Road. Located on one of the highest mountaintops overlooking Montego Bay and the Caribbean Sea, the site consists of 16.5 acres. Twelve buildings, helicopter pad, private tennis court and two swimming pools occupy five acres. Five villa suites (7 air-conditioned bedrooms, with 2 additional lower levels, each with 1 full sofa bed) accommodate as many as 18 guests. With the addition of the owner's private villa (1 air-conditioned bedroom) up to 20 guests may be accommodated. 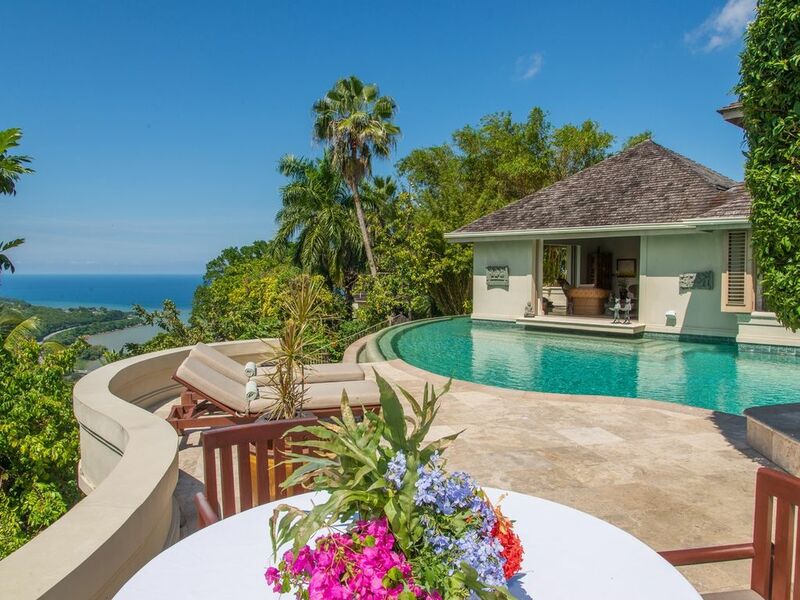 The property is selected, perhaps more than any other private villa in Jamaica, by brides for a destination villa wedding. Additionally, other luxury villas are located within close proximity for hosting other guests within the wedding party. The villa is distinguished by world-class architecture and design, a breathtaking location and exquisite accommodations and service. Hand carved teak doors from Bali mark the entrance to the estate. The main pavilion features sliding glass doors that permit a 360-degree view of the sea and Montego Bay. There are five detached guest houses/suites, plus the owner's villa on the property all with Italian marble floors, antique oriental rugs, original oil paintings from Indonesia and Thailand and patios. Each suite has a living room, 1-2 bedrooms and full bath, satellite TV/DVD, stereo system, wet bar with coffee maker and refrigerator. Additional amenities include an infinity style private swimming pool, tennis court and a helicopter pad. Silent Waters is truly an exceptional home. Guests may choose the grocery options or a prepaid gourmet meal plan. With either option, the staff will work with guests to determine the types of meals desired as well as discuss any allergies or special dietary needs. Please note that wine, liquor, soft drinks, and bottled water, are purchased from Silent Waters liquor, wine and beverage inventory and are billed separately, as well as fresh fruit used at the bar. Additional charges apply for cocktail parties and other guest hosted events. Dining at Silent Water's is an amazing experience. The Head Chef creates memorable meals from his state-of-the-art commercial kitchen and grill. His repertoire consists of Continental, Nouveau and local Caribbean cuisines. The main dining area may be glass enclosed or left open. It is accessed by stone stepping pods and the dining pavilion is located in a wrap-around reflecting pool and has 330-degree panoramic views of Montego Bay as well as the Caribbean Sea. The dining room tale is a stunning and rate rainbow colored 15-foot slab of Brazilian granite.